I partially grew up in Bonny Doon, California, and I've been doing computer work since 1997. I spent most of my twenties working as a software dude at Santa Cruz Operation and VMware. I've worked for Hitachi since 2010. Some generous souls have written testimonials for me: view testimonials. 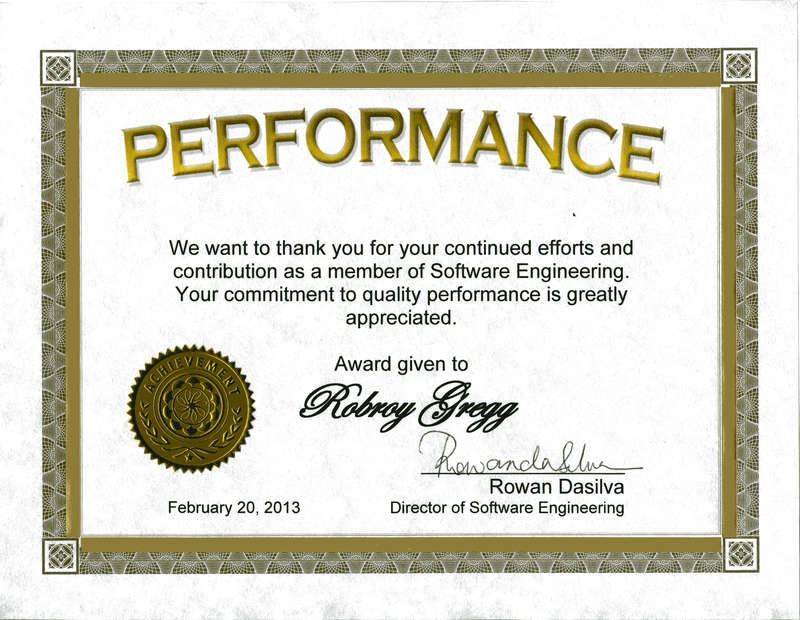 Hitachi Data Systems gave me this award for writing a continuous integration and automatic test system for a NetBackup OpenStorage plug-in project. It worked by watching the source code control system, and every time it saw a commit, it'd update the checked out files, compile the plug-in (by running build scripts written by others), re-install a NetBackup Master server and two Media servers, install the plug-in, test a backup and restore through the plug-in and check the restored data's integrity. It showed its results on a dynamic Web page. The system ran on OpenBSD and was mostly written in Tcl and Expect, though the NetBackup computers it controlled were RHEL 5 and Win2k8. 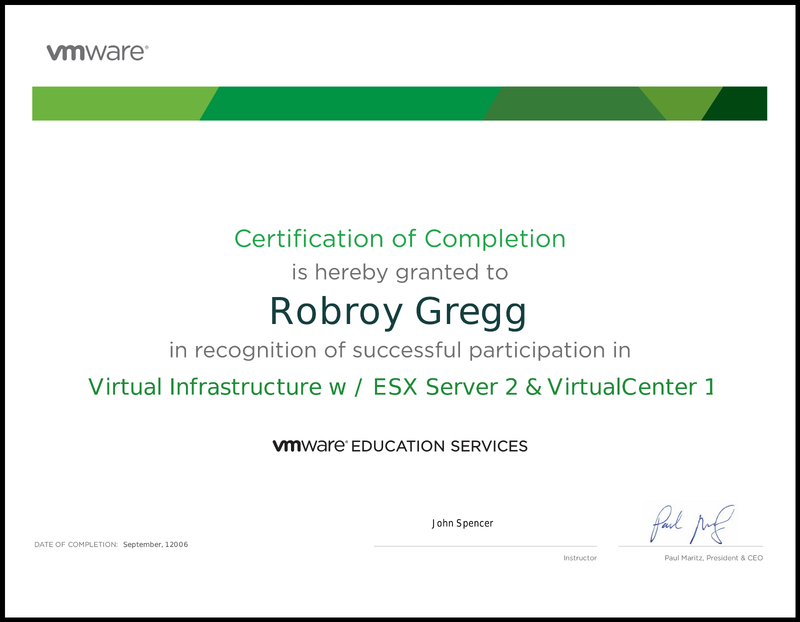 VMware paid for me to take some classes while I worked there. 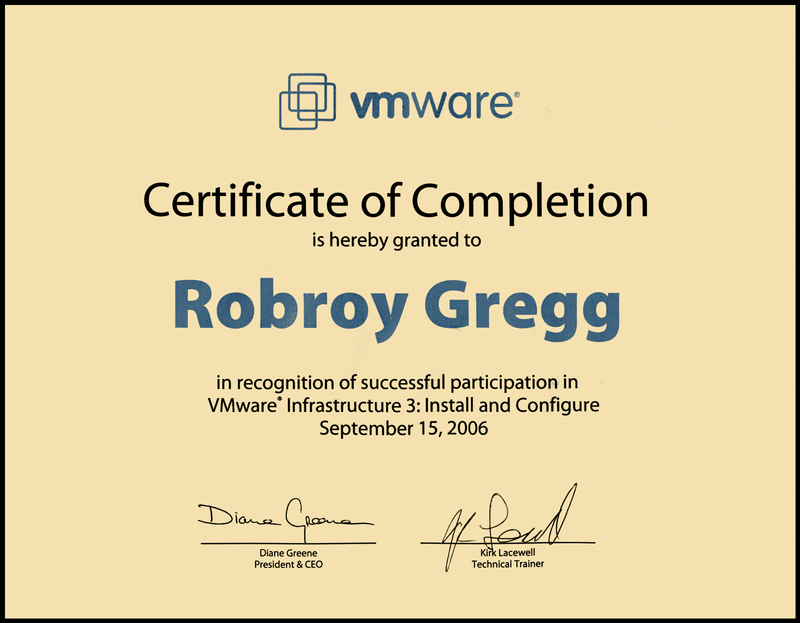 I took a Virtual Infrastructure 3 class and was given this certificate. The class was taught by Kirk Lacewell; he really knew a lot about ESX. I also earned an ESX Server 2.5 certificate. I'm familiar with Windows Server operating systems through Windows Server 2012 R2. I have a classic Microsoft MCP certificate for Windows NT Server 4.0. This Web server's a 10.3-RELEASE FreeBSD jail on a Supermicro computer. Copyright Robroy Gregg, Computer Dude 2018. All rights reserved.